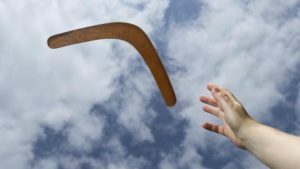 Last night as I sat uncomfortably and unexpectedly on my hospital cot with my teen son in the patient bed by my side, I thought “ahh, the childhood toy the boomerang.” The boomerang is a thrown tool originally made in Australia for hunting, typically constructed as a flat airfoil, it spins about an axis perpendicular to the direction of its flight. It is designed to return to the thrower. As the Clinical Social Worker that I am, the thought of a tool or now evolved toy, reminded me of the concept of resilience. In the field of mental health there are many concepts that are now studied in terms of understanding how and why some are more resilient than others. Why is it that two people can be faced by similar challenging circumstances and one may be proficient at problem solving and overcoming obstacles while the other is suffering? Such that facing a crisis may throw one person into relapse if they are practicing sobriety, or may bring one to a depressive episode or even suicide ideation. We know that part of the fundamental issue here is one’s resiliency factor. When one has resiliency skills he/she can bounce back, not letting a perceived crisis serve as regression. Resiliency is the capacity to recover quickly from difficulties and/or the ability of a substance or object to spring back into shape, i.e. elasticity. This brought me to the boomerang. Odd parallels can be recognized when one is sleep deprived in a hospital room. The plan for Saturday night was to have a romantic date with my incredible husband; however, around noon that day my son, as he was buckled over in abnormal pain, accurately self-diagnosed himself with appendicitis. After racing to the Emergency Room, hearing the hospital call in a surgeon, anesthesiologist and operating room nurses, we just stayed hopeful that the appendix did not rupture. After blood work, scans, vitals and all other medical assessments, the operation was discussed and planned. Not the plan we had for a Saturday night; hence, we had to be resilient, bounce back, and be grateful for the quality health care we have within a few miles of our home.